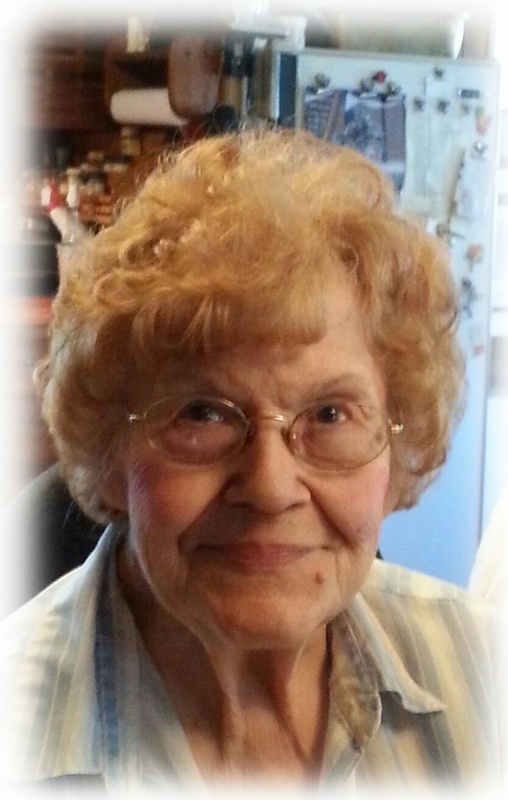 Mary Johnson of Vavenby BC was born on July 5, 1927 and passed away on September 1, 2015. She is survived by her loving husband Villy Johnson; son Steven, his wife Ricki and their children Cameron and Kimberly; son Jim, his wife Diane, and their children Marni, Ashly and Jamie; daughter Donna, and her children Leah and Kimberly; daughter Pam and her partner Gary and children Gregory, Steven, Andrew and Carrie; numerous great grandchildren; Mary’s niece Kathy and nephew Scott, Mary’s cousins Rob and Barb; Villy’s twin brother Vern; nieces Daisy, Nicole and Caroline; Mary’s best friend and partner in crime Trevor Harder; Fay and family (care giver and friend); their very good friend and neighbor Don (personal driver and TV fixer); and many more friends in the community. Mary was predeceased by her sons Greg and Bruce; Grandpa Thoen (Mary’s father); Ethel and Jack Rempel (Mary’s mother and step father); and by her sister Jean Magee. Mary was known in the community for her kindness to everyone and all animals. We could all wish to have the same kind of love that Mary and Villy shared. Villy was Mary’s nurse this past four and a half years, doing what most men could not or would not do. He never left the house without giving her a kiss and saying I love you. Mary was involved with the thrift store and spent many hours sorting buttons. She was a member of the local church. She also gave to many charities. Mary’s passions were Villy, her children, and let’s not forget her dogs and cats and every other cat in the neighborhood. Not one neighborhood animal ever went hungry. Both Pam and Donna loved their mom’s wonderful sense of humour, her intelligence and her kindness for others. They admired her diplomacy when dealing with others; they both wish they could be more like their mom. Mary had a great passion for shorthand and excelled at it in school. Even just this last month she had her shorthand books by her side so she could look them over. Mary was a part of the Trimmerettes group for many years. They were a close knit group of Mary’s very good friends. Another great love of Mary’s was driving her big white car with Trevor by her side. She loved knitting (socks for Villy) among other things, scrap booking and her cats and dogs. Mary also loved her ice cream, especially eating right out of the bucket; she would share with which ever cat or dog happened to get the chair right next to her at the table. Her favorite foods were ice cream, prawns and anything spicy. Mary will be missed by many. A Celebration of Life was held at the Vavenby Hall on Saturday September 12, 2015.